Wow. 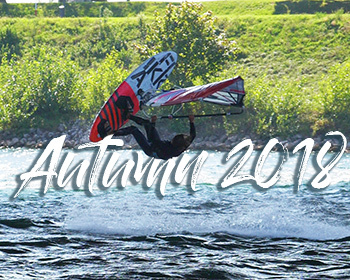 That has been the best Autumn in Austria, since I ve been Windsurfing! The bridge was going of, a lot of perfect south-east wind days, really awesome conditions I could share with some of my best friends. I think after travelling so much the last 1,5 years coming home and sail almost every single day at the spots where you grew up, is just as good as it gets! When the South Wind kicked in September me and my buddy Jo started working on a proper Windsurf Action Clip straight out of Vienna. It will take part in the Panasonic Windsurf Video Competion hosted by Windsurfers.de, it will be online pretty soon! Beside ripping up the Danube we got some storm days on Lake Neusiedl aswell. Hell yeah, nothing beats the feeling of being totally overpowered in some pure flying water gusts, two days stayed in my mind: First we experienced a massive NW day in Podersdorf. Flying water everywhere, measured windgusts up to 120km/h, me totally stacked on my Idol LTD 3.6 and my small Flikka FS Board. WHAT AN AWESOME DAY! A few days with SE directly followed the big storm, and guess what it got even better. THE DAY of the Year! If you were following my stories on social media or here, this year Neusiedl was a bit of my Kryptonite, I just did not get warm with the spot during the EFPT Event there. Anyways a forecast popped up which predicted up to 45knots South Wind. Usually I would go to Weiden, but my friend Luki convinced me to give Neusiedl another try. Already on the way there, I heard on the Radio that’s up to 100km/h South Wind in Neusiedl. I was excited. After a few runs on my 4.0, I changed down to 3.6. And I was sailing until it got dark, as it was just THE DAY OF THE YEAR. I think for me it was also a gamechanger. As I finally realized I can land also the hardest moves in not ideal conditions when I pulled of my first planning shifty and some crazy Airfunnel Burners and Kabis in the mega chop. I think it has been at least one year that I ve been so stoked about Windsurfing! And for sure my personal highlight of 2018, which is crazy when you think back on what kind of dream spots I ve been, that I still find the biggest pleasure at the place where I grew up, where I learned to Windsurf and what I call my home! What’s next? Right now I need to catch up with some projects I was working on the whole year to still push it out. There are three Windsurf Videos coming in the following weeks – so prepared! The plan is to squeeze in at least one or two Croatia trips now in December for some R&D Work on new Flikkaplans. I would love to hit the mountains aswell, as I ve a really cool new Cooperation coming up. Anyways latest in Jannuary it will be the time to kick Windsurfing 2019 of. I was thinking quite a lot how Windsurfing could be then. After all those years it is still my big Love. So there is only one way. Windsurf More. More Quality. Go Bigger and send it more!